Accompanied by singing, drumbeats and smudging shared by special guests from the Native Canadian Centre of Toronto (NCCT), Crescent School unveiled its land acknowledgment statement at a full-school assembly on January 15, 2019. 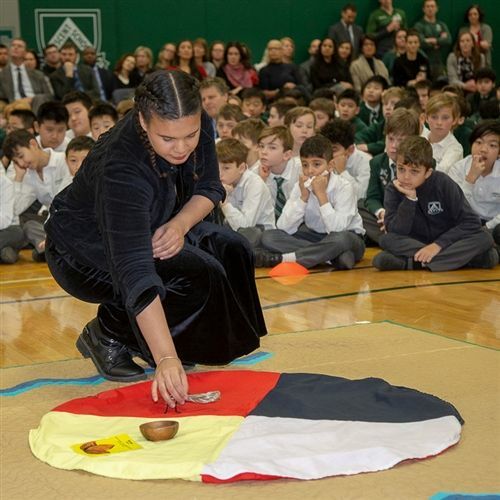 “Today we are honouring the nations who have held a connection to this land since the time of creation,” said Headmaster Michael Fellin at the assembly. Land acknowledgments are statements that recognize the traditional territory of Indigenous peoples. Crescent School’s campus is located on the traditional territory of the Huron-Wendat, the Petun, the Haudenosaunee, the Mississauga of the New Credit First Nation, one of the peoples of the Anishinaabeg Confederacy and the Metis Nation, and is still home to many Indigenous people from across Turtle Island. Crescent’s land acknowledgment was developed in consultation with the NCCT. At the January 15 assembly, three NCCT representatives – Christarr Waabska Ajijaak Smillie, Kayla Sutherland and Nathan Roy – spoke about important elements of Indigenous culture. Sweetgrass, tobacco, cedar and sage were placed on a medicine wheel on the floor of the gym, and some of the sage was burned in a smudging ceremony to symbolically purify the space. Kayla Sutherland and Nathan Roy sang and drummed, and Christarr Waabska Ajijaak Smillie told the creation story of her Anishinabe culture. The land acknowledgment is just one step in Crescent’s work to build relationships and understanding with Indigenous peoples. Last year, Crescent students travelled to Ontario’s Superior North region to experience a week in the life of First Nations young people there. A similar trip will take place in February 2019 to Moose Factory, Ontario to learn about the heritage and traditions of Cree First Nations. Closer to home, activities such as classroom art projects and local Outreach activities are also underway.